New Delhi, August 10: The Lok Sabha has passed the Central Goods and Services Tax (Amendment) Bill, Integrated Goods and Services Tax (Amendment) Bill, Union Territory Goods and Services Tax (Amendment) Bill and the Good and Services Tax (Compensation to States) Amendment Bill. The four Bills seek to amend the Goods and Services Tax laws to make return forms simpler and raise the turnover threshold for availing composition scheme to 1.5 crore rupees. 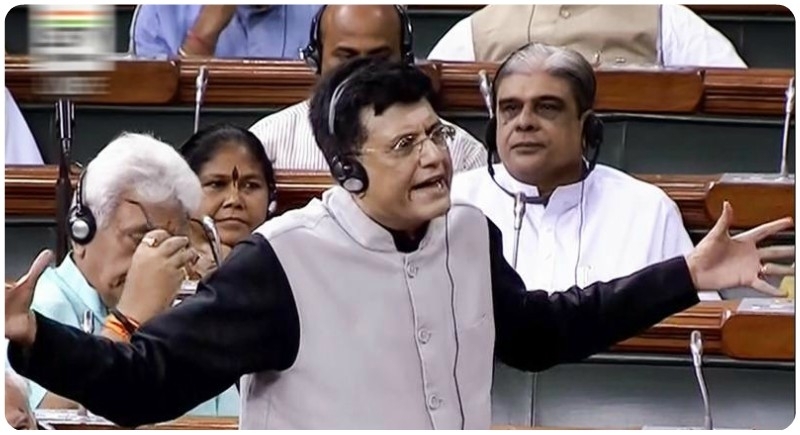 Replying to the debate on the bill, Finance Minister Piyush Goyal said, the Government is empowering 125 crore people through GST and it is the best example of cooperative federalism. Earlier, moving the Bill, Finance Minister said, GST collections are in-line with the budget aim and that the government expects the economy to grow faster than the IMF projections.